This page contains a character guide for Scarecrow in Injustice 2. Here you’ll find movelists, combos, juggles, strategy guides and recommended gear for the villain character. For more Injustice 2 content, head over to our Injustice 2 top page. Scarecrow is a brilliant psychologist turned super-villain who fights Batman in Gotham City, specializing in techniques and chemicals that manipulate fear. Jonathan Crane was originally a well-respected professor, although he lost credibility when he obsessively took his experiments too far and descended into madness, becoming obsessed with spreading and experiencing fear as the Scarecrow. Scarecrow plays on the fears of the unknown to inflict terror on his victims. An anarchist obsessed with using chemistry and psychology to spread and study fear. He joins the Society in order to sow panic on a global scale. Meter Burn R2 (must press R2 at the end of Death Spin). Fear Toxin does damage over time to the opponent. Air Fear Toxin does damage over time to the opponent. When Inner Fear is activated a cloud of Fear Gas surrounds Scarecrow. The cloud of Fear Gas will do damage over time to the opponent when close to Scarecrow. 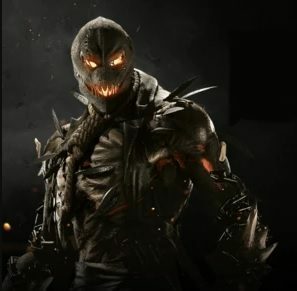 Damaging the opponent with Fear Gas will build the Fear Meter and allow Scarecrow to perform Traumatize when the Fear Meter is full. Traumatize can only be performed when the Fear Meter is completely full. Below are combo and juggle inputs for Scarecrow , including corner strategies and restarts. Scarecrow is a character with good overall range, arguably better than most characters in the game. With less experienced players, you’ll be able to surprise them with just how much range you have if they think they’re in a safe distance away from you. Among his best moves to create space between you and your opponent is his Death Spin (↓,←+□). Scarecrow has a good zoning game with his chain, though is in quite a disadvantage against other zoning characters like Deadshot. Your best bet against such characters is to close the distance at much as possible. Against non-zoners who always want to keep the pressure up close like Bane, Cheetah, Robin or Catwoman, you can rely on shots from afar to avoid being rushed down. Be sure to mix up attacks with Fear Toxin to gradually build up your Traumatize. You’ll be in better position to set-up stronger combos with a full Traumatize like the last combo (6th) in the Combos and Juggles section. 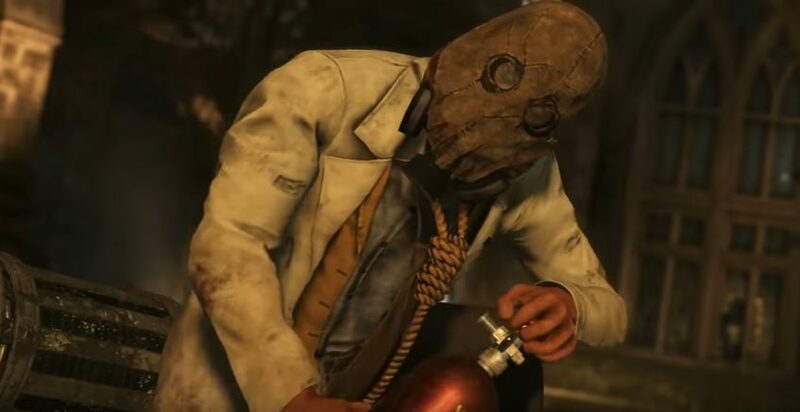 The Scarecrow wears raggedy brown garbs over his chest and stitched brown pants, a hangman’s noose over his neck, with his mask having both a hood over it and needle like stitching in it, with gas filters on both sides of his mouth. On his right hand he wears a customized glove with several syringes attached to them connected to a tube filled with his fear toxin. Scarecrow appears differently in the comic than he does in the game, most likely due to the fact he was not revealed as a stage transition character until some time after his initial appearance in the comic. Though Scarecrow appears in several panels in the Year Five comic series, this was a production oversight and as such is considered non-canon, as confirmed by Brian Buccellato on twitter. Scarecrow’s appearance in Injustice: Gods Among Us and stage transition in the same game is a reference to the 2009 video game Batman: Arkham Asylum. That last combo was the one I was looking for thanks.